BeijingThe pig carcasses - about 14,000 of them - have been floating down rivers that feed into Shanghai for nearly two weeks. The city's residents have been told not to worry, and not much else. Where the pigs came from, how they died and why they suddenly showed up in the river system that supplies drinking water to a city of 23 million has not been explained. Officials have told residents their drinking water is safe, while authorities have censored microblog posts suggesting that the public organize peaceful protests. The official response reminds many of the government silence that surrounded previous health concerns, from the SARS epidemic to bird flu to contaminated milk. "They are only giving the runaround," said Huang Beibei, a Shanghai microblogger whose revolting photographs of the pigs first prompted local media coverage and government attention. "'Who believes what they are saying?" "Those pigs must have come from somewhere," author Li Mingsheng said. "That's a basic question, but the government still has not told us that." Authorities have retrieved at least 13,996 dead pigs as of Wednesday, and have released daily bulletins saying drinking water in Shanghai remains within national standards. Except for pig tallies by Shanghai authorities and one late-night news conference by a local official in nearby Zhejiang province, where the pigs are suspected to originate, no top official and no head of any government agency dealing with the environment, health or agriculture has made any public comment. Officials so far have punished only the eight small-time hog farmers whose pigs could be traced through ear marks. The farmers in the Zhejiang town of Jiaxing, where hog farming is a major industry, were each slapped with a fine under 3,000 yuan ($480). The central government in Beijing, which has been enmeshed in a leadership transition, dispatched a chief Agriculture Ministry veterinarian, but Yu Kangzhen's conclusion was merely that there had been no major outbreak of swine disease to blame for the dumping. Villagers have told local media that pig dumping spiked in the wake of a police crackdown on the illicit trade in pork products harvested from dead, diseased pigs. With no black-market traders to collect their dead pigs, farmers are simply dumping them in rivers, they say. Other observers have suggested that farmers are feeding pigs small amounts of arsenic to make their skins look shinier, thus increasing their mortality rate. Government officials have not addressed either theory. Jiaxing's vice mayor, Zhao Shumei, told reporters Friday that pigs were succumbing to cold weather, and suggested it was largely baby pigs that were dying. Critics of that explanation swiftly noted that most of the carcasses downstream have been of adult hogs and that this winter has not been harsh. The Associated Press sought comment from the governments of Shanghai, Jiaxing and Zhejiang and from the Agriculture Ministry, but the calls were either referred to another agency or not answered. Authorities have not censored popular jokes spreading online in China. In one joke, a resident of smoggy Beijing boasts he doesn't need cigarettes because he can simply open his window, and a Shanghai resident responds that he gets pork soup from his faucet. But when Shanghai-based poet Pan Ting suggested in a microblog that the public take a stroll as a subtle way to complain about the dead pig tide, her posts were scrubbed and she lost access to her account. "From hog farming to industry regulation, from animal disease control to public health and to regional coordination for investigation, every government link has malfunctioned - except social control," said Zhao Chu, a Shanghai-based independent scholar and media commentator. "The government is not holding itself accountable to the public," Zhao said. "Because there's no parliament or administrative law, government officials do not care about the public but only look up to their bosses - because their positions come from above." Government silence has played a role in several health crises over the past decade, and in allowing the SARS pneumonia to spread in 2003. SARS killed 774 people and infected thousands of others, mostly in China but also in two dozen other countries. In the wake of the epidemic, the Chinese government revamped its public health crisis management. Not included was a requirement to tell the public. In recent years, the government was silent while bird flu spread, and while it became clear that milk and infant formula had been contaminated with an industrial chemical, killing at least six babies and sickening thousands of others. The government's earlier behavior raises doubts about whether officials are revealing everything they know about the pigs. "As to the cause of death and the risks, the government has been evasive and vague. The explanations are bordering on being ridiculous," columnist Liu Shengjun wrote on his microblog. "It reminds me of SARS, and I hope history will not repeat itself." The crisis has exposed a systematic failure in China's management of environmental issues that cross municipal boundaries, said Peng Xizhe, dean of the School of Social Development and Public Policy of Fudan University. "Shanghai might be the victim, but the problem originates in the upstream Jiaxing," Peng said. "Under the current management system, the upstream government is unlikely to conduct responsible investigation." "As for the central government, it's hard to say it is directly responsible because it is not responsible for the daily operations, but when it comes to watershed management, it should provide some policy and guidance in management," Peng said. Si Weijiang, a prominent Shanghai lawyer, said Shanghai and Zhejiang - as neighboring governments - are careful not to blame each other. "They have to work together," Si said. "It's impossible for them to criticize each other openly." 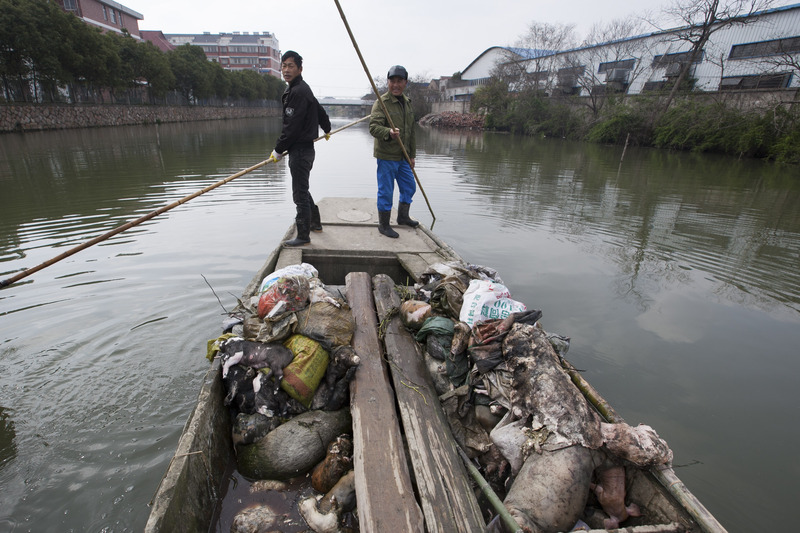 Zhang Jian, a biotechnology salesman in Shanghai, said governments in various municipalities involved should cooperate or set up a task force on the pigs befouling their waterways. "It is just disgusting and the government's statements have been unbelievable and disappointing," Zhang said. "I bet it will end up with nothing definite. That is the typical Chinese-style solution."